A Giant Granny Square Quilt - traditionally known as a Trip Around the World Quilt - is what has been keeping me busy this week. Inspired by the work of talented quilter and knitter Jan Burgwinkle (www.bemused.typepad.com and Instagram - Jan Burgwinkle) who is hand piecing a Trip Around the World Quilt. 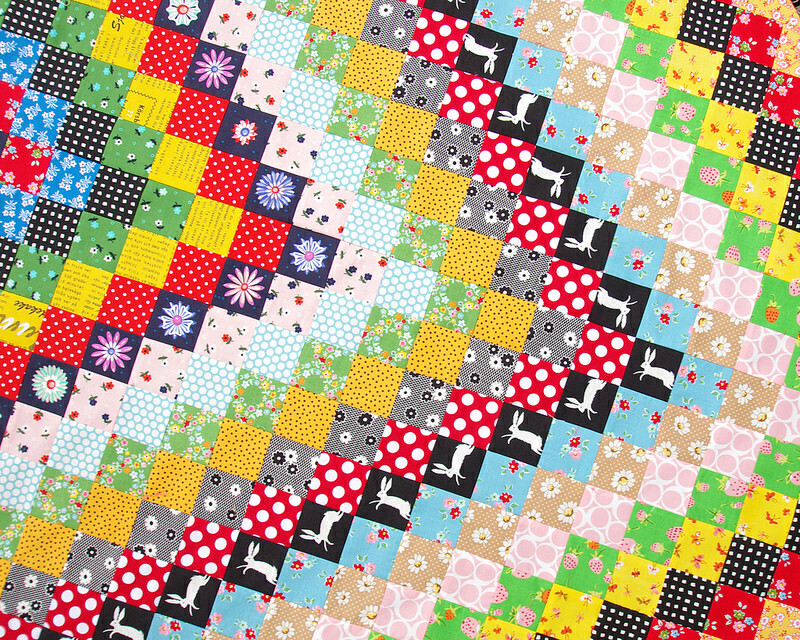 A Trip Around the World Quilt has long been on my quilt bucket list, however I am not ready to start another hand piecing project just yet, and so I decided to tackle this quilt by machine. There is no quick and easy way to piece this quilt by machine - I couldn't figure out a strip piecing technique that would work with this on-point layout. Instead I started with the center square then added squares radiating from the center out, until the entire quilt was laid out on the floor in squares and setting triangles for the edges. 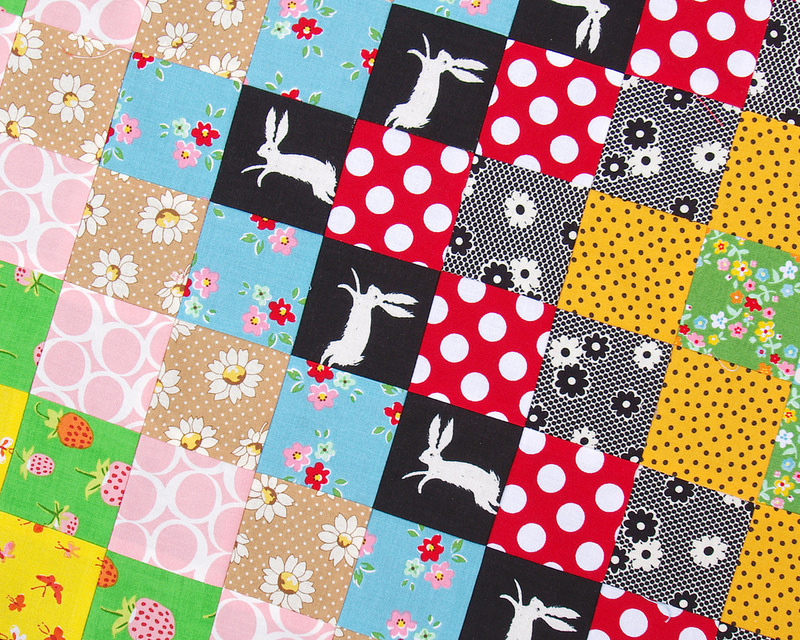 I then picked up the squares in diagonal rows - with each pile/row of squares carefully placed as I wanted to keep the fussy cut bunnies hopping clockwise around the center of the quilt. What could go possibly wrong? Sewing rows of squares is not difficult but sewing squares and rows in the correct order calls for another level of concentration. But nothing a seam ripper can't fix. Choosing fabrics was hard! Not only was I looking for sufficient contrast between the rounds of squares but also a variety of fabric designs - dots, florals, text prints etc. Fussy cutting two rounds added interest as well as strong contrast and structure to the quilt. 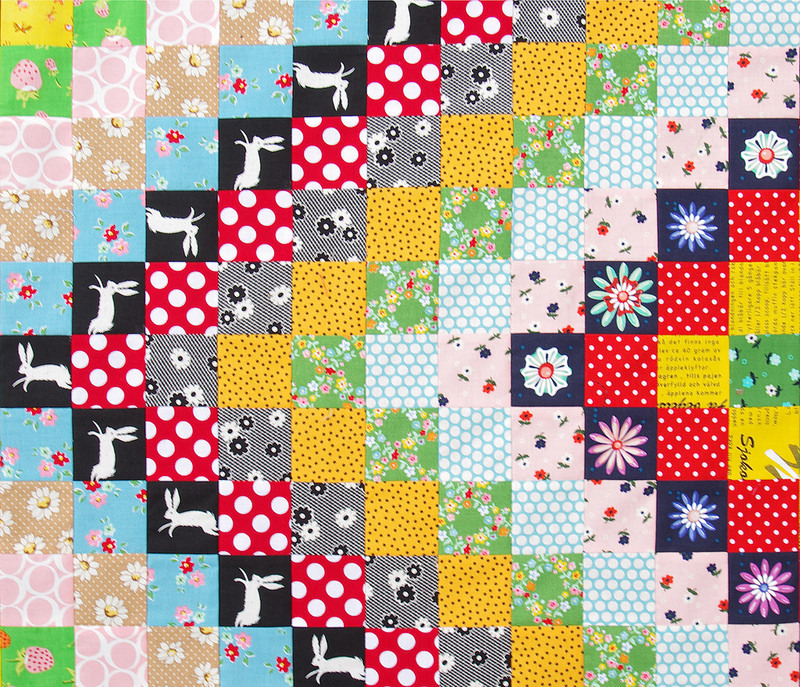 Many fabrics were auditioned and many more fabric squares were cut in addition to those that made it into the quilt. More scraps for my scrap bin! 1 center square plus 22 of rounds of squares, plus setting triangles. Quilt Top measures 63.5 inches x 63.5 inches. Cotton + Steel ~ Ghost Bunny from the Black & White collection 2015. Cotton + Steel ~ Squared from the Black & White collection 2015. Cotton + Steel ~ Navy Enamel Flowers - Picnic by Melody Miller. Cotton + Steel ~ Mini Flowers in Coconut (Pink) and Icing (Green) - Cookie Book by Kim Kight. Text in Yellow - Lighthearted by Ayumi Mills. I really enjoyed the task of choosing the right fabrics for this quilt and I am thrilled with how it turned out. Having 900+ two and a half inch squares of fabric squares laid out on the floor was a challenge for everyone in our home but that won't put me off making another Giant Granny Square Quilt! LOVE it! Your rabbits are wonderful!! Oh, Rita, how wonderful! I'm so happy to have been your inspiration for this quilting adventure. Isn't it a fun design? Such a simple template for serious fabric play. I agree, choosing fabrics is the most time consuming part of this design ~ so many considerations at each round! Yours is just spectacular. Thanks for the nod and links. My poor blog has been neglected recently but coincidentally, I've been getting things together this week and will be posting again regularly soon. Thanks again! I gasped when I saw this. This is absolutely beautiful!!!!!! This is quite the undertaking, but a challenge never seems to stop you in your tracks! 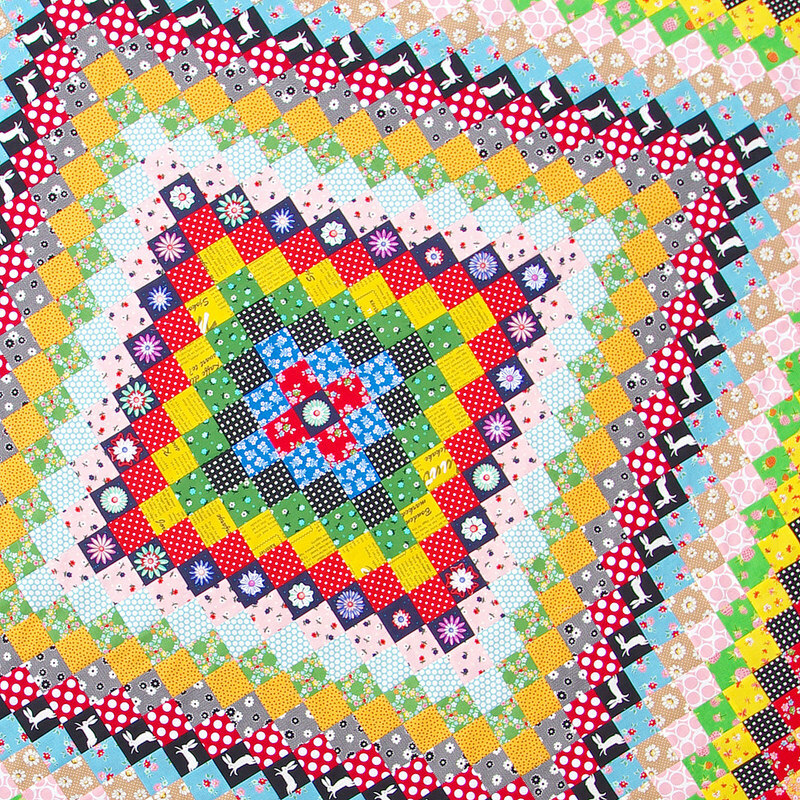 Your quilts are so fresh and happy. You inspire me, even if I'm no way good at the perfect piecing. 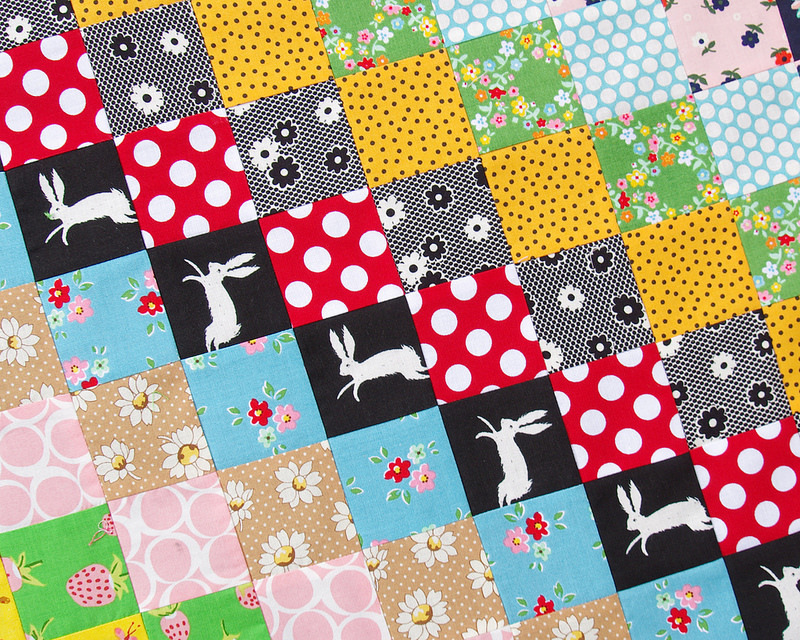 Finally, I adore those fussy cut bunnies that are romping around the quilt. I keep coming back to it this morning. When I saw the first picture, all I could think about was Joseph's amazing coat of colors. This turned out great!!! Love your fabric choice. 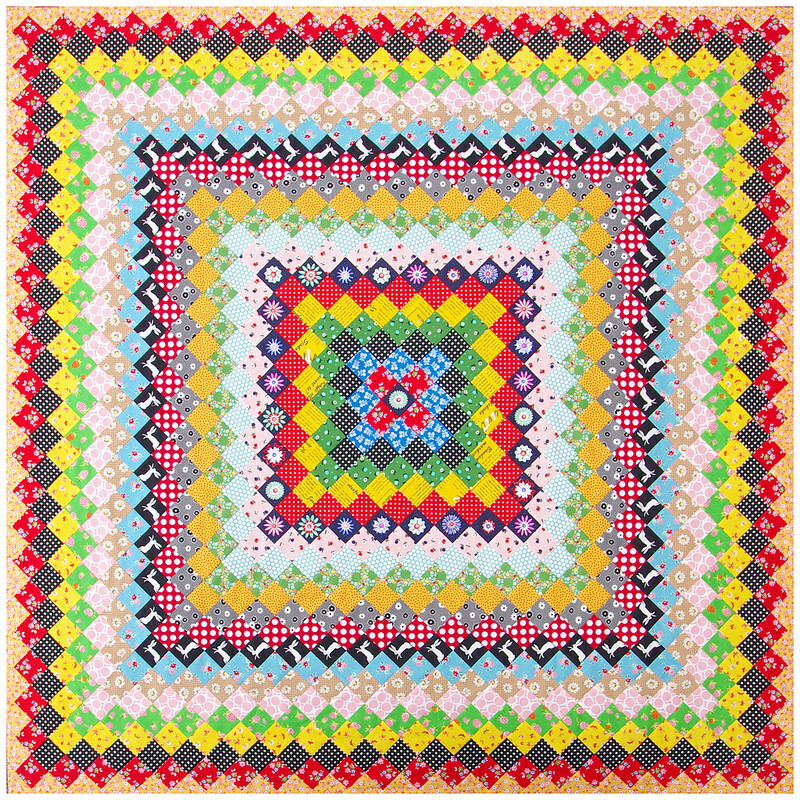 Rita, your color choices are amazing and that is one of those quilts that make me go "ooo!" As always, gorgeous METICULOUS work!! I absolutely adore this quilt. Beautiful, Rita! Love the fussy cutting! It makes the quilt so interesting. A great quilt Rita! Wow, I love it. This one is a real gem! Wow! 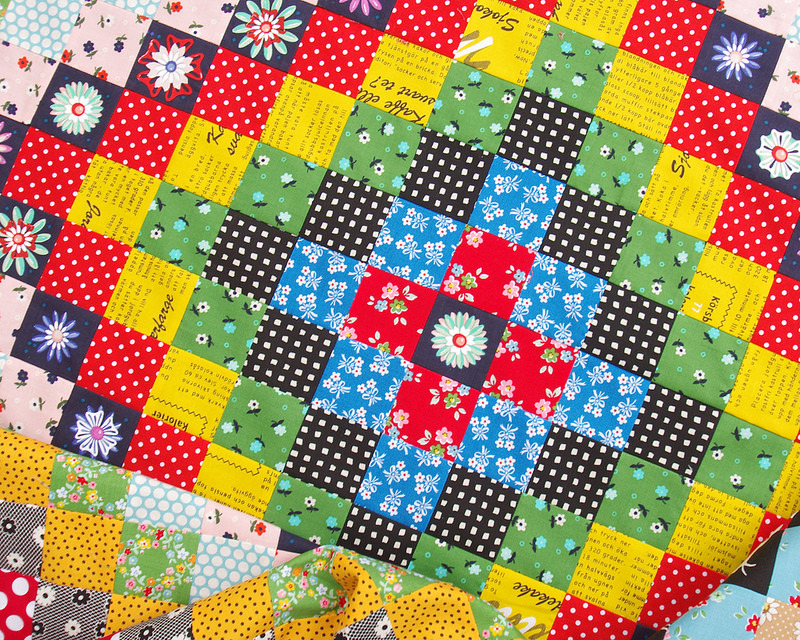 Your quilts are always stunning!! I can't imagine piecing all those pieces and keeping them in the right order and right direction, yikes! The bunnies are fun, of course, but I also LOVE the center of your world and all the fussy cuts of the flower round. Spectacular! Rita, you are insane. In a good way, of course ;-) That is an amazing quilt. 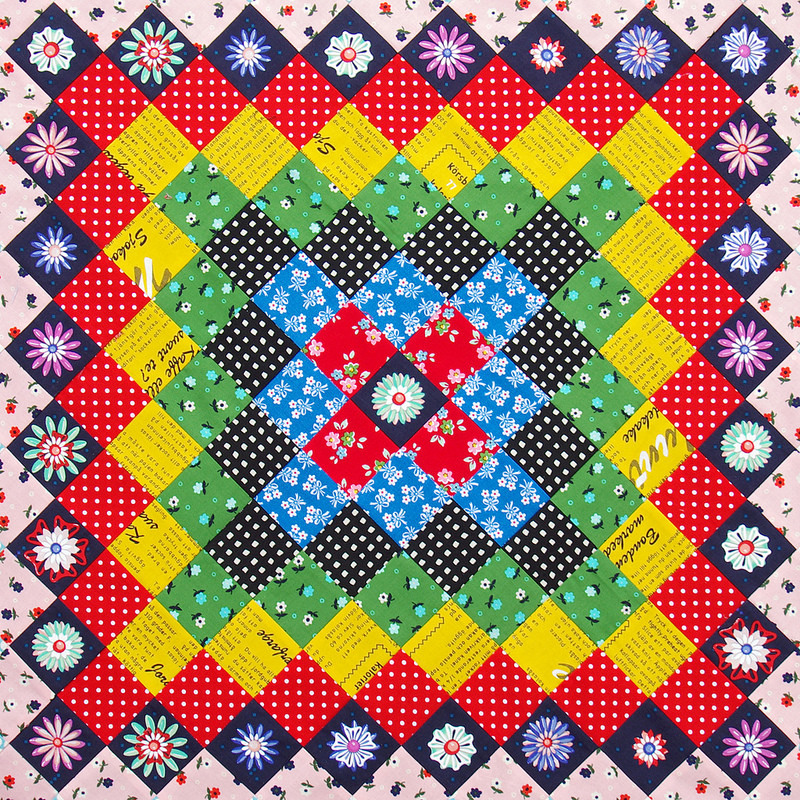 Boston Commons is another name for this quilt design. yours is lovely. 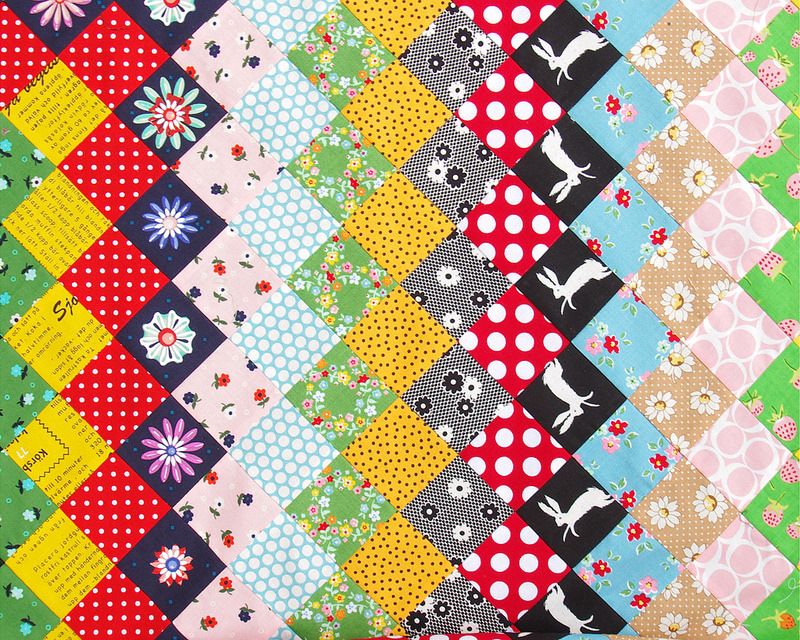 Another lovely quilt. 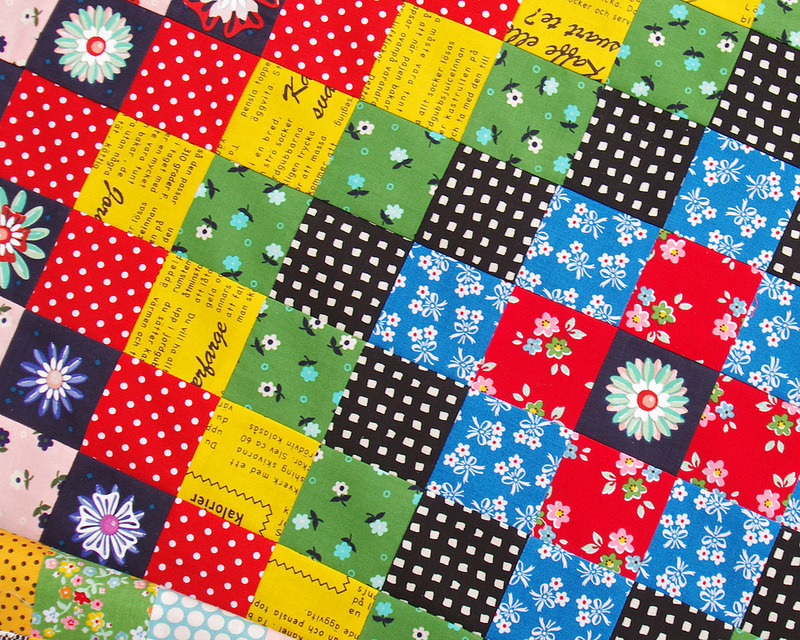 You continue to inspire quilters around the world. 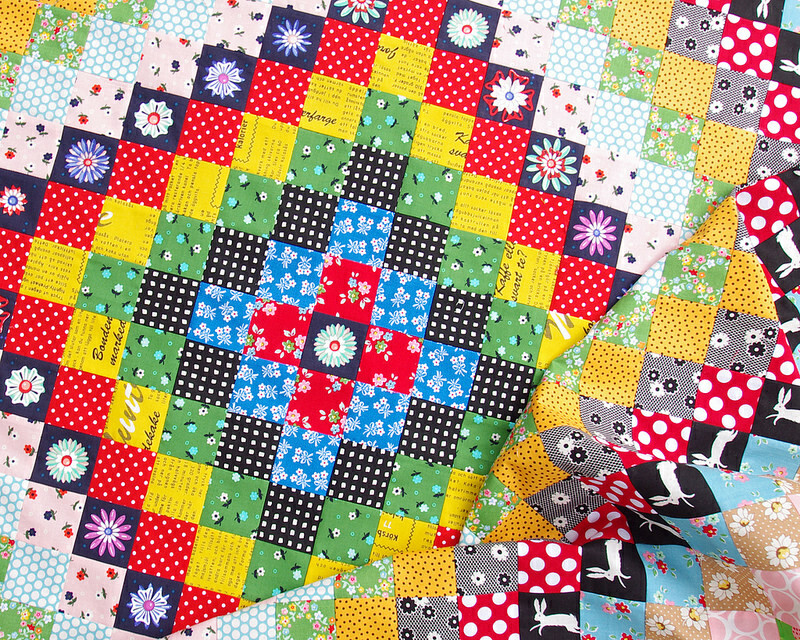 Actually there is a way to sew this quilt without leaving your chair. 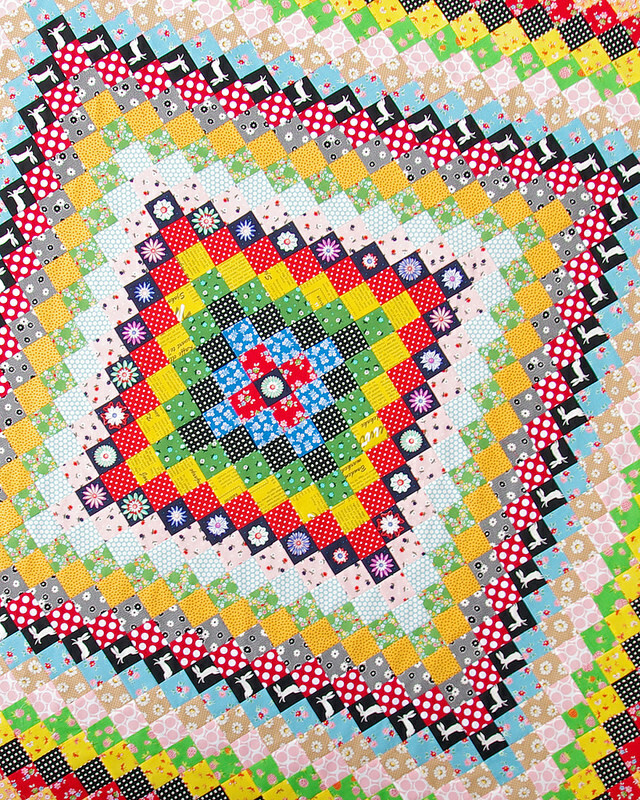 It involves stacking the squares, then staring from the centre, sewing the rows in a continuous chain piece. Hard to explain without a demo - which I just did for my quilt guild last month! It’s fun. Oh, Rita, you've outdone yourself! The intense yellow, the fussy cutting and the repetition of colors...it's stunning! Simply stunning.....but there's nothing simple about this beauty! That is just beautiful. It makes me smile! Your fussy cutting amazes me! The rabbits are dancing all around, it's beautiful! And incredible. Wow! You are such an inspiration to me! I love all your quilts! Beautiful quilt! Do you recall who made the black & white stripe you used for the binding? I would love to get my hands on some of that!